Here’s a blurb: Could it be any other? The suspense has been killing you, right? I doubt it’s any sort of surprise to you that Symphony of Praise is my favorite album of all time. I’ve said so on numerous occasions in various places online. It’s one of the first full southern gospel albums I ever obtained, and ever since that day, it’s been my favorite. And nothing has really ever come close. First, the performers: Symphony of Praise features my all-time favorite bass singer, my favorite baritone, my favorite tenor, and my top two lead singers of all time. All five are not only my favorite singers, but are also on my list of “southern gospel heroes” for their Christian examples. Second, the songs: This is no ordinary southern gospel album. Produced and arranged by the legend Lari Goss, with accompaniment by the London Philharmonic Orchestra, it’s just a majestic listening experience. Five of the songs are a cappella (I love a cappella singing), with breathtaking vocal arrangements. The other five are the orchestrated ones, and each one features a different singer. Each one is utilized to their greatest strength, and each one delivers a flawless performance. Finally, the impact: Symphony of Praise was a major part of the transformation of southern gospel from four singers and a piano, or even a full live band, to four singers backed by a big track. One can debate whether or not that is a good thing overall, but it’s hard to argue that there isn’t some great value in the types of big ballads that have impacted gospel music fans in the last 25 years. It’s also hard to argue that it didn’t really all begin with Symphony of Praise. For the Cathedrals, the album placed them at the top of the southern gospel music field to stay until their retirement. For Gerald Wolfe, “Champion of Love” put him on the map and launched a Hall of Fame career. And lastly, for me, the songs have been a blessing more times than I can count. Great album, great choice for #1, and indisputably one of the all-time greatest Southern Gospel albums of all time. Technically speaking, it actually begun with the Couriers in the late ’70s, right around the time of their Statue of Liberty and Mighty Power projects. I don’t recall which was the first album on which they did this, but they ultimately utilized the services of the London Symphony Orchestra – ten years before Symphony of Praise. 🙂 They are usually credited as the first to introduce soundtracks to the programs. 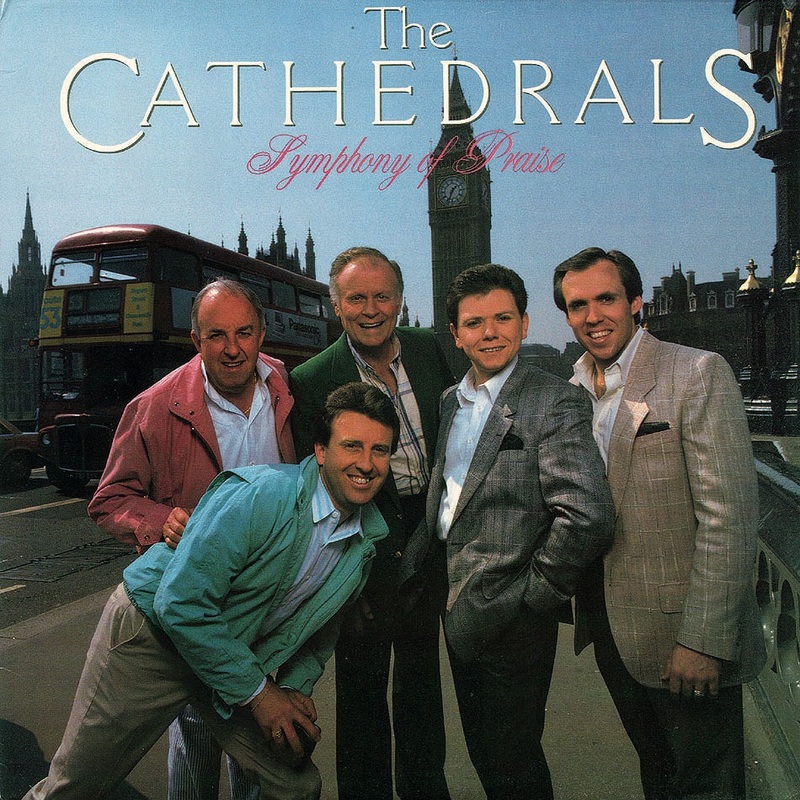 Given the influence they had on the Cathedrals, especially through the 70s, they paved the way for Symphony of Praise. That’s not to take away from SOP’s breakthrough status as the album that really made the trend mainstream. It wasn’t the first of its breed, but it was the breakthrough. Excellent historical contribution! I have read of several instances where the Couriers were really influential to Mark and Gerald specifically, but I’m not so familiar with them myself. That’s why we have people like you to keep us straight! Thanks, and thanks for taking it the right way – just an interesting historical point, not a criticism! They may often be credited with first using soundtracks on programs, but the Goss Brothers used tracks in programs first. This might brand me as being crazy, but I’ve always thought Symphony of Praise was a bit overrated. The high points are really high (“Champion Of Love”, “For What Earthly Reason”, “God Himself The Lamb”) but some of the other stuff just didn’t do much for me, especially “This Ole House.” I enjoy Travelin’ Live a lot more. Brian, congratulations on finishing the countdown. I can’t express how much I’ve enjoyed reading it and going back and listening to the projects you have called my attention to. Thank you! I still love what the final lineup brought to the live stage. But I’d have to say that if I made a top ten list of the Cathedrals’ all-time greatest albums, fully half of that list would be albums with Danny and Mark. I have said before, Danny was who first appealed me to the Cathedrals. There was a shortage of high, full-voiced tenors (or at least every SG quartet pretty much at that point I had heard had the girly sounding ones). I do understand though that some would say it is because that is the Cathedrals I discovered first. However, other groups have been in situations like that yet I liked latter versions better (who I could admit were better) or at least appreciate them for what they were. I still liked the two latter versions of the Cathedrals and at times could admit they did better on certain songs and did good on songs of their own. I could even appreciate former versions on certain things. However, even with all tht said, think this version of the Cats was special and they are still my favorite overall. 🙂 I guess overall it comes down to what type of group you like (in addition to material). However, even with the common material (between different versions of the group) I like this one most of the time. Occasionally there will be something that one version did better than another due to the members, but still. On a similar topic, groups like the Cathedrals and GVB would often find the best person they could (even if they were totally different than their predecessor) and in fact sometimes groups would intentionally look for someone totally different on purpose. In these cases, although thy would still do some old material, they would sort of reinvent themselves. Yeah, but at least when I was listening he nailed those Dbs like no one’s business and the others I heard either couldn’t reach them or sounded like they’d sucked on helium. And one of the all time best Album Covers (and if you have the LP, best back cover! minus what looks like a shadow to the bottom left of the front side) SOP is definitely one of the classics, but the concept of it is definitely historically unique…even if it wasn’t completely “brand new”. The Couriers were definitely a big influence to a lot of young artists by the time the 80s had rolled around. Great album by my all-time favorite group. It would definitely make my Top 5. I agree with Brandon about “This Old House”, though. I’d move it down and move up “Dig A Little Deeper” up into the Don’t Skip category. It’s been interesting seeing your favorites. It seems that there were few selections prior to the 1990s. I’m just curious if you have, or considered, projects from the 60s and 70s? Great question, Mr. Adkins! There were only two albums in the entire Top 100 recorded prior to 1982. They are both Inspirations albums from the 1970s. The simple answer is that while I have obtained a decent number of older recordings in the last several months, I am not familiar enough with most of them yet to make a judgment on them. Those two Inspirations albums contain songs that I knew from my childhood, when they were the only group I knew. So they got a little head start. If I did this again two years from now, it might look completely different. I’m your elder and I have never seen you call me “Mr. quartet-man”. LOL I am just messing with you, Brian. I’d like to correct myself slightly. There are actually 3 Inspirations albums from the 1970s that made my countdown: Touring the City, When I Wake Up, and Heaven’s Bright Shore. Look me up at NQC and we’ll see if we can remedy that situation. As much as I enjoyed the Symphony of Praise album, The Cathedrals did 2 albums in the early to mid sixties titled ” With strings” and “With Brass”. The orchestra thing had been done before so I dont know if you could call this album ground breaking, not that is wasnt an outstanding album. I realize this thread is a bit old, but I would like to weigh in on my all time favorite SG group here. I was first introduced to the Cats in 1982-83ish. My grandmother would take me to the Battle of Songs at Will Rogers Auditorium. The first lineup that I saw and fell in love with was Younce/Payne/Trammel/Talley/Bennett. After Kirk left, I still loved them when Danny took over. I stopped listening to SG in the 90’s, but now have had a revival of sorts the last few years. Obviously, Funderburke and Haase were power tenors and I do appreciate that to some level, however I believe the Talley years was the best lineup because of the blend and the charisma of Talley. If you’re judging tenor singers by their range and power, then I won’t argue that Talley doesn’t rank with them in that regard, nor with those who came before him like Bobby Clark and Mack Taunton. However, i consider the best “singer” at the tenor position who obviously was destined for his own success apart from the Cats. I often use a baseball analogy to describe singers being like shortstops. I would rather have the guy with a weaker arm who understood the game, could cover ground, and make accurate throws then the guy who has a rocket arm that blows you away but almost always pulls the first baseman off the bag. On a side note, I undertook the task of collecting the discography of the Cats a couple years ago and I have 29 more to go. If anyone here reads this and has extra records to sell, please let me know. I have all the Talley recordings and about 2/3 of Funderburks. Still need a smattering of records from the 60’s, 70’s and 90’s.